Can’t think of the name of the yōkai you are looking for? You can browse yōkai by specific categories to narrow down your search. Note that these category pages are not completely inclusive or exclusive. Because of the cryptic nature of yōkai, they are very difficult to categorize. It would be impossible to list every single yōkai related to any one category. Instead, yōkai pages are only placed in categories when there is a significant relationship between the two. 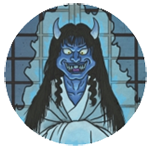 If you feel like a category is missing an important yōkai, let me know.